Each year, approximately 4 million new cases of canine cancer are diagnosed, and this disease now affects 1 in 3 dogs during their lifetime, which is the same rate at which cancer affects humans. But, thanks to ongoing research to find new ways to identify, treat and cure cancer in both humans and dogs, pet owners now have more options than ever when it comes to treating cancer in their pet. One of the most common types of canine cancer – lymphoma — is just one of the cancers that can now be put into lengthy remissions, or even cured, thanks to advances in the field of veterinary oncology. 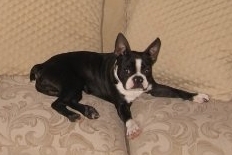 Lindsey Orkis of Macomb, Michigan is hoping that a new treatment option will save the life of her best friend and companion, a 4 year old Boston Terrier named Dolce. Only 4 years old, Dolce deserves a chance to beat cancer. And you can help Save Dolce by donating at http://www.giveforward.com/savedolce. Dolce is a puppy mill survivor, found by Lindsey when he was 6 months old. Before she rescued him, he had never been socialized or even let out of his small crate. As a result of this, his legs had become deformed and required multiple surgeries when she brought him home. But with excellent veterinary care and lots of love, Dolce recovered from his early traumas and grew into a wonderful member of the family. She thought the worst was behind him. But then, he was diagnosed with lymphoma. Not long ago, when a dog was diagnosed with lymphoma, one of the most common forms of canine cancer, pet guardians had little reason to hope for a cure. With success rates of less than 2% and remission times lasting on average just over 12 months, current chemotherapy protocols have not been able to offer much promise of long term success. But, canine bone marrow transplants are changing all of that. Doctors at North Carolina State University’s (NCSU) Veterinary Teaching Hospital are now using bone marrow transplants (BMT) to treat canine patients with lymphoma. It’s a new application of an existing technology responsible for saving the lives of thousands of humans each year. Lindsey has already received some financial assistance from animal cancer groups including the Riedel & Cody Fund, but is still a few thousand dollars away from the needed $16,000 to save Dolce’s life and is counting on the generosity of friends, family and dog lovers across the country to help. Lindsey has set up a special website for Dolce at: http://www.giveforward.com/savedolce. But, time is running out. If you would like to help Save Dolce, please visit his site and make a donation – large or small, every donation makes a difference. To learn more about canine cancer and resources available to help pets and their people, visit the Georgia’s Legacy website at www.fightcaninecancer.com. Georgia’s Legacy is an online resource for pet owners founded in 2007 whose mission is to improve awareness of canine cancer among pet owners and to provide information and resource referral to those whose dogs have been diagnosed with this disease. Most of all, Georgia’s Legacy was created to provide hope and emotional support to those in the fight. For more information, visit www.FightCanineCancer.com. This entry was posted in Cancer Treatments, News, Stories of Courage and tagged bmt, bone marrow transplants, canine bone marrow transplants, canine lymphoma, dog cancer treatments, north carolina state university, riedel & cody fund, save dolce. Bookmark the permalink.